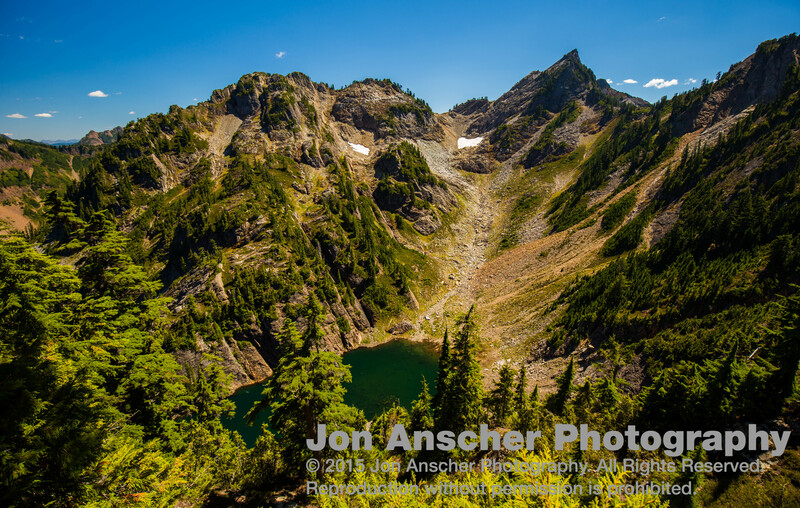 Gothic Basin is a popular, albeit intense, hike to a pristine alpine landscape. Located at the end of the paved section of Mountain Loop Highway, this hike begins at the old Monte Cristo Road. The road has been closed for many years now, though local landowners can drive in some of the way, however the road is ill maintained for vehicular traffic (be prepared for some sections that require high clearance), and a wash out 1 mile in makes passage past that point impossible. Hikers can travel that flat, pleasant road almost entirely undisturbed by cars. Once reaching the final washout, there is a trail that will take you to the junction with the Monte Cristo Road. Toxic sludge from the Monte Cristo mines? You decide. It’s important to note that the road is closed as of 2015 with no date yet set for the reopening. The old mines of Monte Cristo have led to toxins entering the water supply, which the Forest Service is in the process of cleaning up. 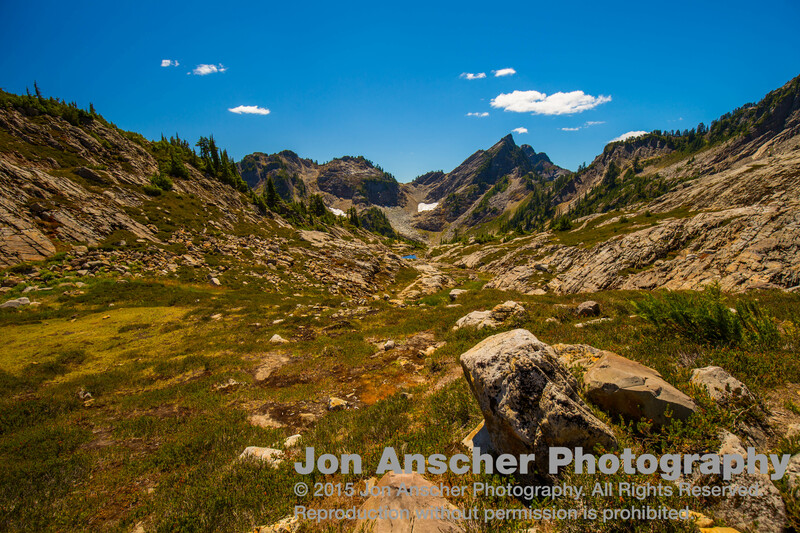 Stay right and you’ll continue on until you see a sign for Gothic Basin and Weeden Creek. This is where the flat ends. The first quarter mile from here is a gentle climb that quickly turns to steeper switch backs. Here you begin the 2800 foot climb over the next 3.5 miles. 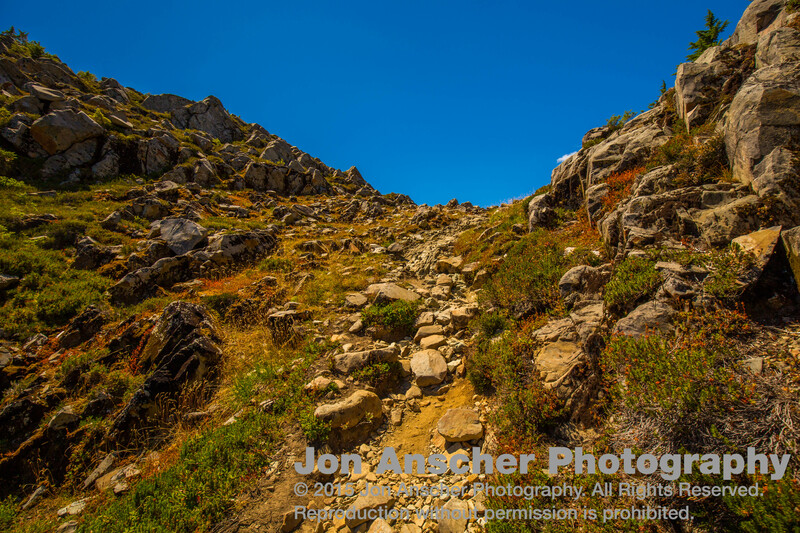 Sometimes steep and sometimes really steep, this trail climbs from the forest and into the subalpine and eventually alpine terrain. While bathed in beauty, this terrain is also bathed in the dangerous radiation of the sun, so come prepared with sunscreen and sun clothes. The trail loops around and by several streams along the way, so you can easily get away with carrying a liter at a time if you have a water filter. Hopefully that will still be true at the end of this very hot summer. Your first exposure to the sun baked climb is a short traverse across several exposed gullies. At least one of which provides a good source of water. After this, you’ll be climbing in and out of the trees until you hit the subalpine meadows near the end of your climb. At about 3/4 of the way up, the trees give way to meadows, and here is where the views begin. Across the way, you will see the peaks surrounding Monte Cristo. A you continue to wind your way up, you’ll see the meadows shift to a more rocky alpine basins high above the valley floor. Here you will begin to see trails dividing and small ponds dotting the landscape. Though, as the heat of summer pervades, many of these alpine oasis’s may dry up. When you finally leave the sub alpine meadows behind, you will see a trail that veers left towards some small pots. This trail meanders around the elusive Weeden Lake below. If Foggy Lake is your destination, then you must trudge on. It is surprisingly difficult to get a view of this lake. 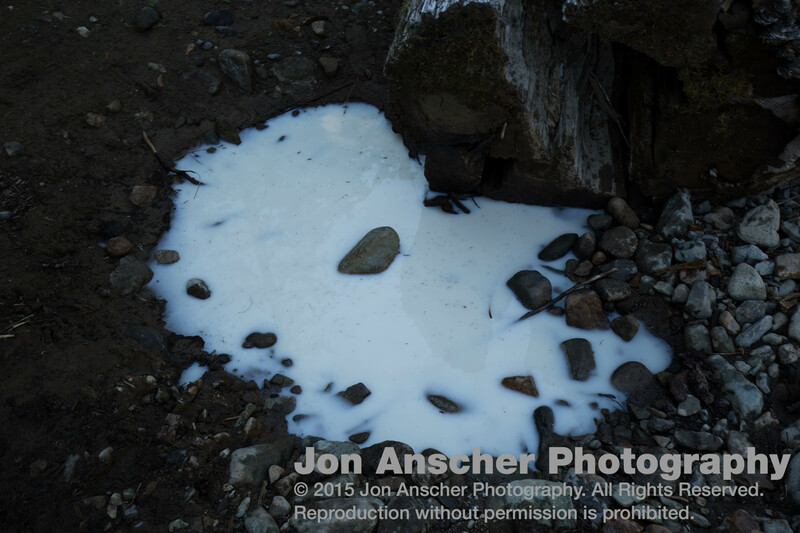 I meandered around this area for 45 minutes, in an effort to seek the lake hiding far below. I finally got a peek that was worth shooting, but not without considerable time and effort bouncing around. I did see the beginning of what looked like a gully access down to the lake, but being here only for a day, I had no desire to get sucked down there, only to have to climb back up again. And the effort just to get this small peek was enough to move me on. Continuing along the way, I quickly came to a small pond. Many mistake this for Foggy Lake, but it is actually the nameless little body of water between Weeden and Foggy. I stopped here to refresh my water and have a small snack. But Foggy was my goal, so in short order, I packed back up and hit the trail. The climb continues from here over a rocky and barren landscape. The silent and beautiful stone towered around me as I struggled up the final leg of my climb. I could easily see how spending and evening or two here would be time well spent. There was more to explore than could be had in a day. With a final push, I came over the rise to the crystal clear waters of Foggy Lake. My breath was immediately taken way as I saw the blue waters against the reddish rock. Taking a load off, I decided this would be my final destination today, and enjoyed the scene surrounding me. Rocky peaks rising above and inviting water below. I did take a dip, though not for long. I stayed only a few brief minutes in the frigid water. While up there, I met a nice family whom I chatted with about the mountains and photography. The father was an instructor for the Mountaineers and a photographer and outdoorsman like myself. You can check out his website, Mountain Groove Photography. I was quite impressed with his work. After basking in the glory of the lake for an hour, I decided it was time to descend. The steep up is perhaps even worse on the way down, but images of where I’d just been still bounced around in my head as I slowly made my way back to the car. This is a place I would surely visit, if perhaps on a less busy weekday.